The English Toy Spaniel enjoys being playful and carefree. This lap dog has many desirable qualities, including being peaceful, cordial, tender, and silent. In addition to its good-natured manner, it can also engage in an energetic play session and be very considerate. The English Toy Spaniel is loyal to its owners and for this reason it can be timid around people it does not know. The breed has a tendency to be stubborn. The English Toy Spaniel does not need a significant amount of physical activity or exercise. The exercise needs can be met with a simple walk on the leash or a play session in the home. This breed does not do well in warm climates. The English Toy Spaniel is not capable of living in an outdoor environment or apart from its owners for any significant length of time. The maintenance of the coat of this breed is minimal, with combing necessary twice per week. The major health concern for the English Toy Spaniel is patellar luxation, which is a condition that involves a dislocation or displacement of the knee. One of the minor health concerns for this breed is early tooth loss. An additional minor concern is a lazy tongue, which involves the tongue never fully extracting from the mouth. On occasion, PDA, or Patent Ductus Arteriosus is seen in the English Toy Spaniel. This is a congenital heart disease that can cause heart failure. There are several conditions that may appear in the English Toy Spaniel that are not a cause for concern, including a soft spot in the skull and toes that are fused. It is suggested that the knees of this breed be regularly tested. The average life span of a healthy English Toy Spaniel is 10 to 12 years. The accounts of the early days of the English Toy Spaniel and the Cavalier King Charles Spaniel are one and the same. The two breeds began as one breed, which is believed to have resulted from crossing between Oriental toy breeds and tiny spaniels. There is some substantiation to the theory that Mary, Queen of Scots, arrived in Scotland with the first toy spaniels brought along with her from France. These dogs were originally referred to as comforter spaniels for their use as foot warmers by the wealthy. During the seventeenth century they were very popular due to the admiration of these dogs by King Charles II, which the King Charles Spaniel eventually received its name from. Early on, all of these dogs were black and tan. Additional colors, such as red and white, were not developed until later when the Duke of Marlborough created this new coloring which he called “Blenheim”. It is believed that this new coloring may have formed from crossing with Chinese Cocker Spaniels. These early spaniels had a reputation for their hunting abilities, but many people were more interested in these dogs for their lap dog qualities. 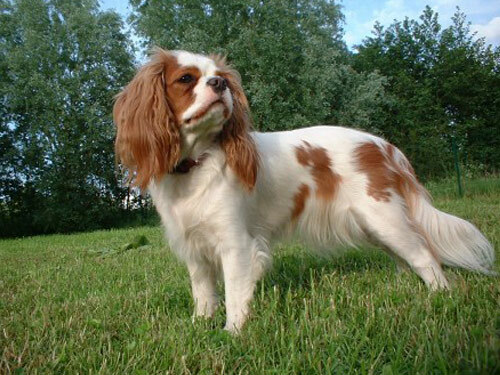 The King Charles Spaniel was eventually bred down to reduce the size and create a rounded head. The name English Toy Spaniel was created in America and many varieties exist today. These varieties include the red Blenheim and black and tan Prince Charles and the solid red Ruby and solid black and tan King Charles. The English Toy Spaniel is playfully referred to as the E.T. or the Charlie and remains a popular lap dog today.